At Maple Lawn Farm, finding the perfect pumpkin is serious business. "You see the kids go out there. They&apos;re not picking a pumpkin; they&apos;re adopting one to take home. That&apos;s what we call it," said Hugh McPherson, the owner of the fifth-generation farm in southern York County. Maple Lawn&apos;s 10-acre patch is packed with 100,000 plus pumpkins of all shapes, sizes and colors, making it a true fall spectacle to behold. Visitors to the farm will have an authentic pick-your-own experience, McPherson said, noting that pumpkins must be plucked directly from the vines upon which they grew. Plus, guests travel in style. The farm hooks its biggest wagon to its biggest John Deere tractor and ferries up to 90 people at time to the prolific pumpkin patch. Kids love it, and adults will have to admit it makes for an awesome experience, too. McPherson calls the pumpkin picking the "real deal." "Kids come to the farm to see big stuff they can&apos;t see everywhere else," he said. "There&apos;s nowhere else you can see 10 acres of pumpkins growing. There&apos;s nowhere else you&apos;re going to see that big of a tractor moving around." Maple Lawn Farm is off the beaten path, making a visit there a true fall excursion. But it&apos;s well worth making the half-an-hour drive off Interstate 83. Once on the farm, a sea of orange, yellow, white, blue, green and even pink pumpkins awaits. There are smooth pumpkins and warty pumpkins. Mostly, they&apos;re big pumpkins - like the 46-pounder hauled out of the field recently. "Medium pumpkins are an accident around here," McPherson said. Pumpkins cost 75 cents per pound, but because Maple Lawn never charges more than $12 for a single pumpkin, kids can find a huge one without breaking their piggy bank. That makes it even more fun to hunt for the most gargantuan gourd. The pumpkin patch has even become a popular spot for family pictures and wedding photos. 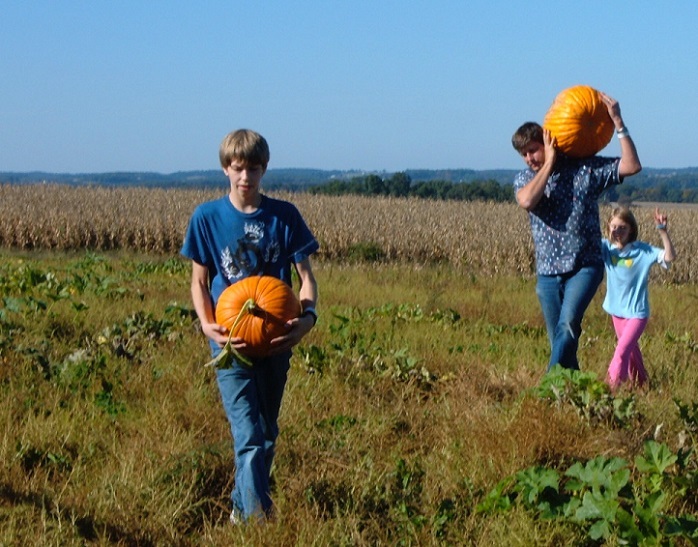 Yet picking pumpkins is just a small part of the fall farm experience at Maple Lawn. Visitors will also find one of America&apos;s original corn mazes, Maize Quest. 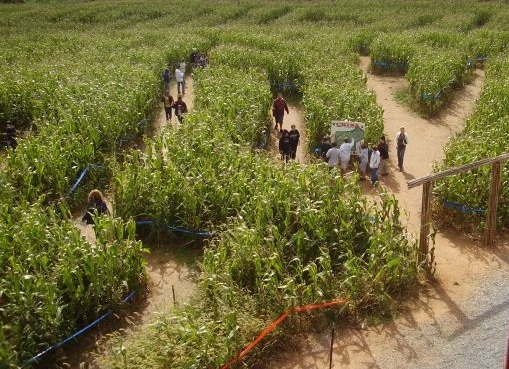 Guests explore a challenging corn maze that stretches across nine acres and changes every year. This year&apos;s theme is Mt. Everest, and adventure seekers can learn about the myth of the Yeti as they navigate the labyrinth. The farm is also a popular stop for student and scouting groups, who come to learn about important crops and pick their own apples from trees overflowing with fruit. Maple Lawn also has a bakery, where apple cider donuts make ideal fall snacks. And the farm recently opened its own winery, where it makes sweet fruit wines and dry, bubbly hard apple cider. An Apple Blossom Wine is delightful for mulling on a crisp, fall afternoon, and the winery just launched its new Apple Infusion, a brandy-fortified apple wine. Add up everything and it makes for an unforgettable fall adventure. So, while visitors might come for the perfect pumpkin, they can stay for everything else at this amazing York County farm. Pumpkin pickers can also visit Brown&apos;s Orchards & Farm Markets and Flinchbaugh&apos;s Orchard and Farm Market for more fall fun. Both offer PYO pumpkins and apples, delicious baked goods and more. The York County Chapter of Buy Fresh Buy Local also offers more information about pick-your-own spots in York County.